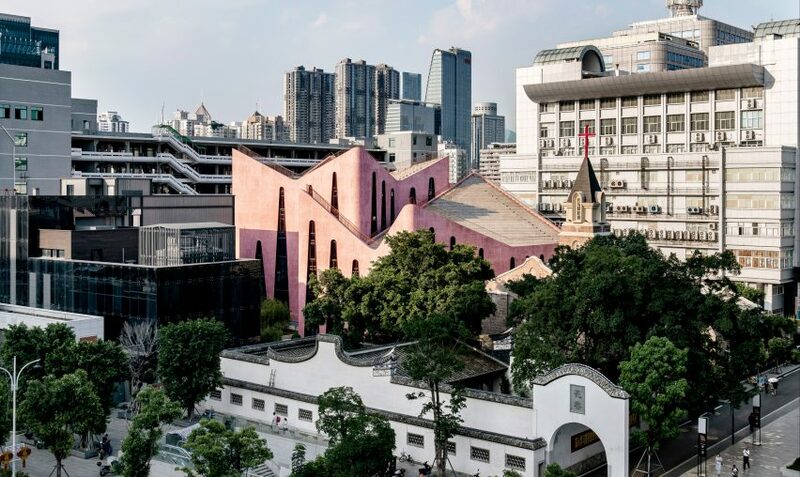 A pastel-pink church hall has been added to the 1930s-built Huaxiang Church in Fuzhou, southeastern China, featuring rooftop amphitheatres that offer open-air services. 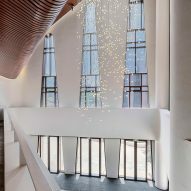 Architecture studio Inuce, which has offices in China and Switzerland, designed the church hall and community centre to accommodate the growing number of Christians in the local area, who no longer fitted inside the 80-year-old church. 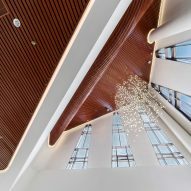 The new building contains a large hall with a capacity of 1,500, along with two multifunctional spaces that can each hold around 500 people. The rest of the building contains music rehearsal rooms for the choir, offices, classrooms for the Sunday school and general activity rooms. When the original church was built, its steeple was clearly visible above the surrounding single-storey houses. But now it is surrounded by office and housing blocks. 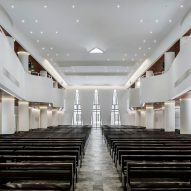 Along with the meeting the functional need of creating a larger space for worship and community events, the building has been designed reestablish the church's place in its urban environment. 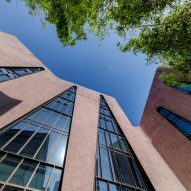 "The new community centre was conceived to embody a change in the congregation's self-perception and to communicate it to the urban audience," Dirk U Moench, principal of Inuce, told Dezeen. "Starting out as an oppressed minority, with only few old people hiding in the seclusion of a backstreet, over the past 20 years the Huaxiang congregation has developed into a dynamic community with mostly young believers." "The new generation's desire is not only to preserve its heritage and to maintain the status quo, but to translate it into a form that reflects their new standing and showcases their potential for society as Christians today – visibly present and actively contributing," continued Moench. 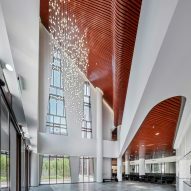 "This needed to be reflected in a characteristic design, which took the traditional church's architecture as a starting point, but also embodied this paradigm shift in the community's vision of itself." The height and form of the building were controlled by height restrictions. 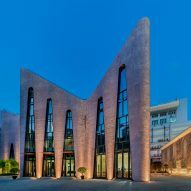 But it was possible to fold the walls of the structure to create a distinctive form that differentiates it from the surrounding buildings. The entire building is clad in pink pebbledash, giving it a distinctive form and colour. 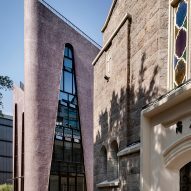 "Visually, this energetic and youthful colour complements the well-aged gravity of the old church's granite blocks and expresses the generational change in the congregation's development," said Moench. To provide additional space for services and to give views across the city, two amphitheatres were created on the church's two roofs. 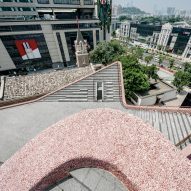 "When used, it is transformed into a stage of urban proportions, from which the community inevitably shares joy and faith with its 'larger audience' near and far, sitting in the surrounding offices and hotels," added Moench. 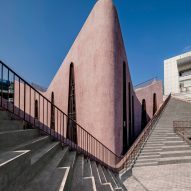 Other distinctive churches that have recently been completed include an elliptical concrete church in Portugal designed by Hugo Correia and a sculptural church in Monterrey designed by architecture studio Moneo Brock. Photography is by Shi Kai/Inuce.